Want To Learn Guitar, But Worried About Travel Time and Hassle? Let Our Expert Teachers Come To You! Learn to play guitar (or play guitar better) in your space and on your schedule. 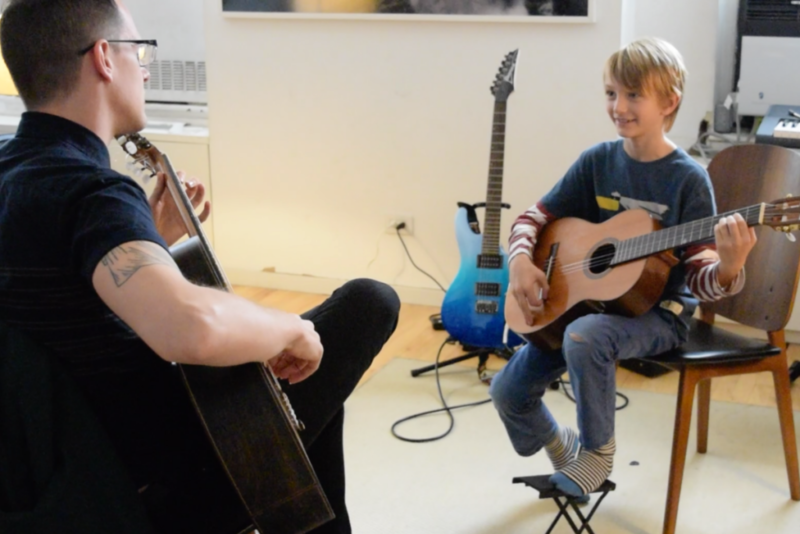 Make progress with experienced guitar teachers and a proven step-by-step curriculum. We teach 1,000 music loving New Yorkers each week. If you want to play guitar--now you can! 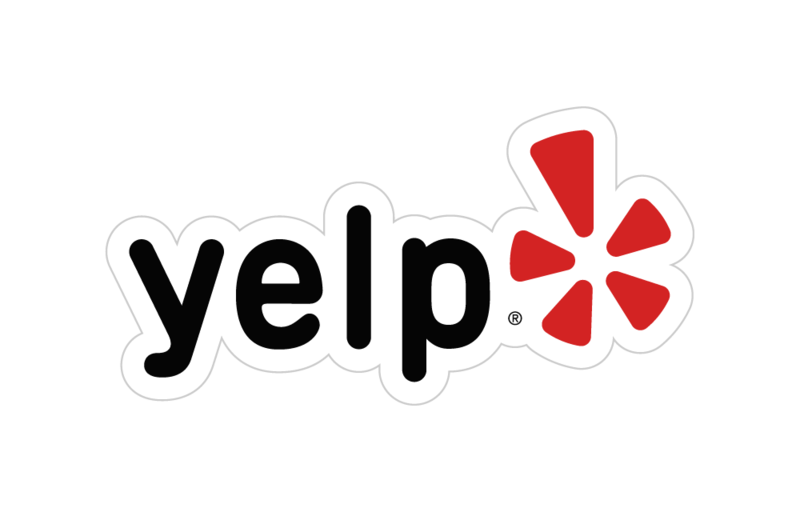 Over 100 5-Star Reviews On Google And Yelp. Still curious? Read more reviews from real students on Yelp and Google. Are you long on your love of guitar, but short on time? 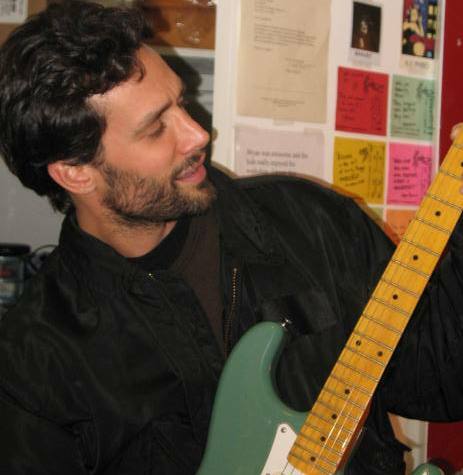 We teach busy New Yorkers how to play guitar (or to play better) in positive, step-by-step guitar lessons on your schedule and in your home. 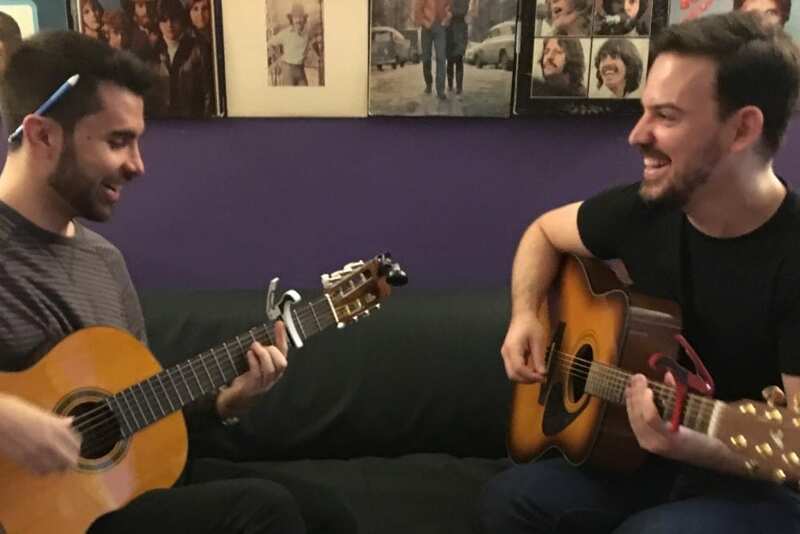 Whether you are beginning your guitar journey or are an experienced player looking to break out of ruts and expand your capabilities, NYC Guitar School's skilled teachers will help you reach your goals Each week over 1,000 busy New Yorkers learn with us. 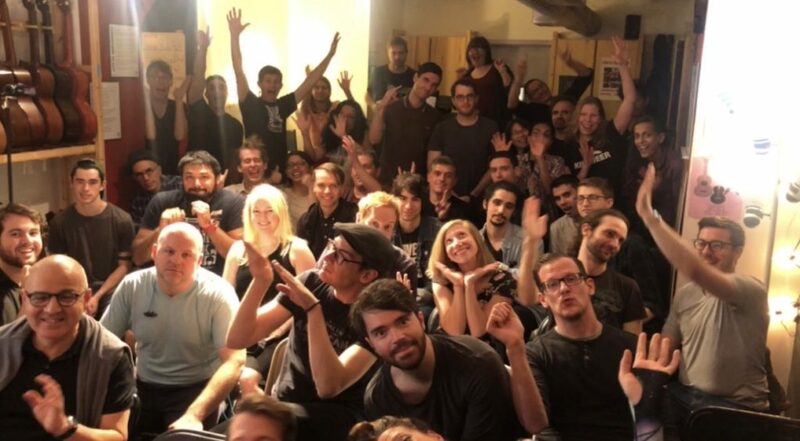 Q: What makes NYC Guitar School different? A: Our teachers, community and curriculum! Our teachers are (of course) skilled players--but they've also gone through a slightly insane hiring and training process including 5 interviews, sample lessons, a sample class and an intense mentoring and training program. More importantly, our teachers join our team because they exemplify our values of relentless improvement, honesty, hustle and being people centered. Our mission is coaching personal greatness one lesson at a time. Our mission driven teachers are the reason we've become one of the largest guitar schools in America. Our community is over 1,000 enthusiastic students and 50 passionate teachers strong. 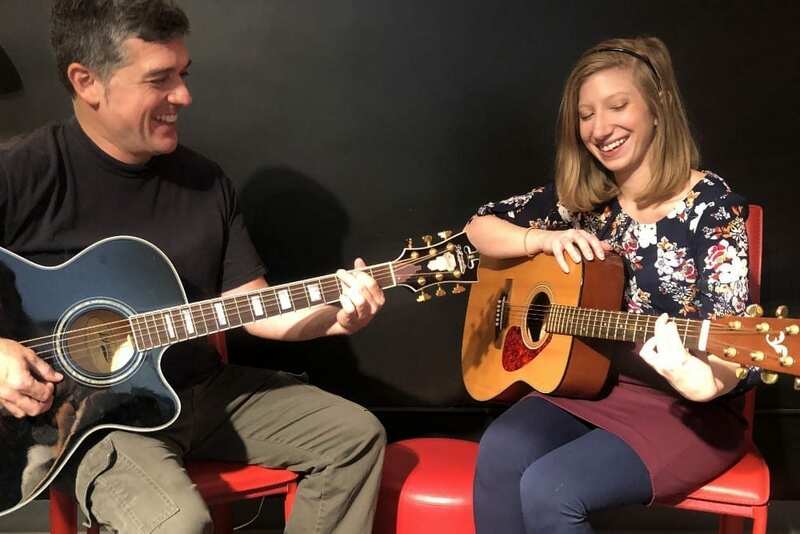 As an in-home student, you can grow your skills and connect with others in school events and performing opportunities like open mics, jams, workshops, ensembles, camps and NYC Guitar School rock bands. And even if you don't want to perform, you are still part of our community. Our in-home teachers use the same proven curriculum used successfully by thousands of New Yorkers in our four locations. You will build fundamentals that allow you to learn songs that YOU are inspired by, and you will learn deliberate practice skills which improve your odds of success in guitar, and in life. Q: How do private lessons work? The first step is to set up a single, no-obligation trial lesson online or by calling 646-485-7244. After the trial, most students continue with regular weekly lessons. If anything changes, we have a flexible 48 hour cancellation policy and unused lessons are refundable. Q: What if I'm a complete beginner? Don't worry! Our teachers are patient and supportive, and we have a top notch curriculum to help beginners gently achieve confidence and competence. Q: Do I need a guitar? Yes--but if you don't have one, don't worry! We can advise you on getting a guitar, and we also offer discounted $21/month guitar rentals to students who want to get started before committing to a guitar purchase. Q: Can I take lessons with a friend? Yes! Experience extra motivation and fun by learning together with a friend for only an extra $10 per lesson. Q: Do you have gift certificates? Yes! Attractive gift certificates are available for any number of lessons.